At first, we thought it was normal teething shenanigans, since she is now the proud owner of SIX(!) teeth. We called the advice nurse, and she advised, with the proviso that if the symptoms didn't improve in a week, to call back and schedule time with a doctor. This KID, with the EYELASHES. Seriously. Five symptomatic days passed with no improvement. On day six, we saw the pediatrician. I was prepared to hear that all-too familiar chorus of, "You're a first time parent; of course you worry about every little thing. It's good that you brought her in." I heard that, along with something completely unexpected. Have you ever had that feeling where you're simultaneously thinking "Ah HA! I KNEW IT!" and "OHMYGOD! Something is really wrong!"? It takes the wind right out of the sails of the S.S. Smug. Then it hit: that moment where you feel guilty for not taking your baby into the doctor sooner. Andrew and I talked through it, and we were doing all the right things, and we took her in sooner than recommended, but still. That pesky Mommy Guilt rears its ugly head. The cure? My mom's homemade yogurt. (The pediatrician didn't get *that* specific, but he said "Yogurt with active cultures". And we all know that my mother makes some seriously cultured yogurt.) Yogurt has been Mom's panacea as long as I can remember, as well as a delicious part of our regular diets. There was the matter of getting the yogurt *into* Genevieve. The spoon was too slow, the yogurt was too runny to finger-feed it to her effectively. I decided to use the encephalized brain that came with the opposable thumbs, and this monkey elected to use a tool specialized for just such an occasion. Yogurt also makes for a great facial. After a few attempts, we had a lot of success using a double handled plastic cup (which is great), which has resulted in increased yogurt consumption and decreased yogurt facials. I am torn on how I feel about this, since wearing yogurt is a family tradition. Three days of Mom's yogurt fixed her right up. Snuggles from *my* mom helped make me feel better. There are days when I just need to know I'm doing okay; and the days where I'm not sure, hugs, hair-stroking, and a "there, there" seem to realign my universe. The yogurt didn't hurt, either. You do what you feel is right for you! Don't let that guilt get to you! Your baby is perfect! Darn, I sure could've used some of that Gigi yogurt the past few days. I didn't even know the flu was going around...and BAM, out of nowhere! I know it's easier said than done, but don't let the mommy guilt ride your back. You did what you were advised to do, and being a parent is definitely a learning process. We don't just automatically KNOW, until the situation presents itself. You are doing a great job, and Genevieve is one beautiful little girl!! Mommy guilt is the worst. 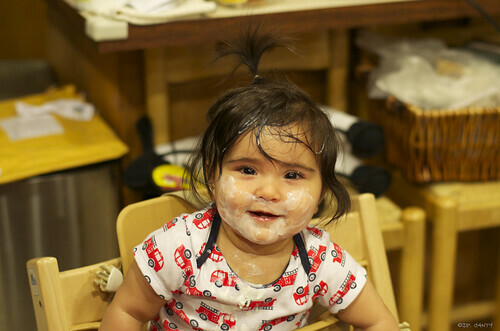 The picture of her with the yogurt on her face is adorable. 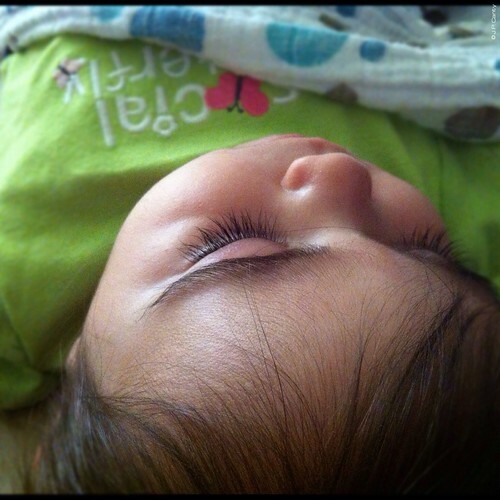 Why do kids always have amazing eyelashes? My son has ones most women would kill for. Lol. When I saw the title I thought you would be discussing a new, gorgeous pair of Fluevog shoes. PS: I can totally relate to the mommy guilt. If you're looking for a way to turn runny yogurt into more of a thick, Greek-style yogurt, run it through some coffee filters or cheesecloth. I do coffee filters in a colander over a bowl in the fridge overnight. It drains off quite a bit of whey and gives you a lovely, thick yogurt!